Tuxedos & ballgowns. Most safari lodges have a very relaxed dress code for dinner, and whilst you will want to wash and change after a hard day game viewing you won’t need to dress over formally for any evening activities. A camouflage safari outfit. In a number of African countries you can actually be arrested for wearing army-style camouflage clothes that could be confused with military wear. Best to avoid at all costs. Overly thick fleeces and jackets. Temperatures on safari change depending on time of day, where you are and what altitude you’re at…so layered clothing is ideal to add or remove as the temperature requires. Heavy walking boots. Unless you’re planning to do some serious hiking a pair of trainers will do for walking around camp and hopping in and out of your jeep. Black and blue clothing. East Africa is home to the tsetse fly which is attracted to dark colors and pack a nasty bite – best avoided by wearing lighter colors. Too much safari clothing. You won’t need more than two or three long and short sleeves safari tops and a couple of pairs of trousers. Zip off trousers that turn in to shorts are useful to cut down on your luggage. Bear in mind most safari lodges offer laundry facilities. Packing it all in one large suitcase. Limit the risk of all of your luggage going missing or being stolen on the flight by packing some essentials – and one safari outfit – in your hand luggage. 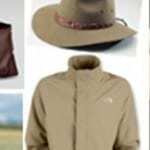 Have you been on safari lately and have some tips on what not to wear? Please get involved in the comments section below!